Azaleas are a flowering shrub of the rhododendron plant genus. Azaleas thrive in damp, temperate climates. Most azalea varieties bloom in mid-April to mid-May. All North American or native species of azaleas are deciduous and easy to grow. They are disease resistant and make an attractive addition to any landscape. They are over 1000 varieties of azaleas that come in many different colors. Some are vivid, sparkling shades, while others are soft pastels or pure whites. Their blooms produce a light, floral scent. White colored azaleas can be used as an accent plant to a garden that includes vibrant, bright colored flowers. Azaleas are quite versatile and can be used a number of ways in your garden. They are effective in the formal foundation planting as well as in the natural shrub border. Choosing different colors or color patterns of azaleas can convey a different feeling and look to your landscaping. White azaleas are a commonly used azalea. White azaleas can be used as an accent plant to a garden that includes vibrant, bright colored flowers. They provide contrast and can produce a cottage-like feeling to your landscaping. White colored flowers denote innocence and purity. White azaleas represent healing and a warding off of negative energy. 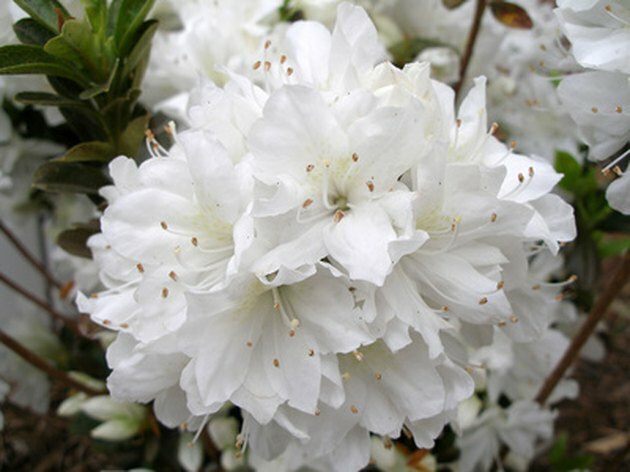 Two common white azaleas are Delaware Valley White Azalea and Girard's Pleasant White. Yellow azaleas are the prefect choice as a bordering shrub in landscape designs. Yellow azaleas look beautiful when paired with an assortment of wildflowers. Yellow means happiness and adds cheer to any landscape. Yellow azaleas added to a patio or entertaining area will welcome your guests and provide a warm feeling when you entertain in these areas. Two popular yellow azaleas are Azalea Pontica and Cheerful Giant. Red azaleas look beautiful with flowers of contrasting colors such as white and light pinks. Red azaleas are known for their bold, bright blooms and these bushes look nice placed along a white fence because of the contrast of the two colors. Red denotes passion, love and romance. Red azaleas include varieties such as Fireball and Moonlight Rose. Pink azaleas look beautiful when placed amongst lush, green plants or evergreens. Pink azaleas' delicate and whimsical tones balance the deep, dark tones of any plant that produces green foliage. Azalea with pink blooms include Cascade Pink and Debutante. Purple azaleas have bright purple, ruffled flowers and shiny, dark green foliage. Purple azaleas represent pride, dignity and success. They can be grouped alone in a bold range of rich hues or they can be mixed in with different colors to provide depth and contrast. Purple varieties include Millennium and Orchid Lights. Brian Clark is a high school special education teacher. He has been a teacher for the past 10 years. Clark is a writer for the local newspaper and eHow. He has previously served as the head of the journalism club and tutors students in all subjects. What Goes With Mint Green Walls? What to Paint the Siding of a Pink Brick House?